Our day begins at 4:30 am. We are to be packed and down in the lobby by 5 to catch a bus to a train to catch another bus. And so it begins. Our bus deposits us at one of the New Delhi train stations. I have to say when I read the itinerary I was a little excited about experiencing an Indian train ride. I have seen the Darjeeling Limited and so naturally I am prepared. Note: Movies aren’t real. 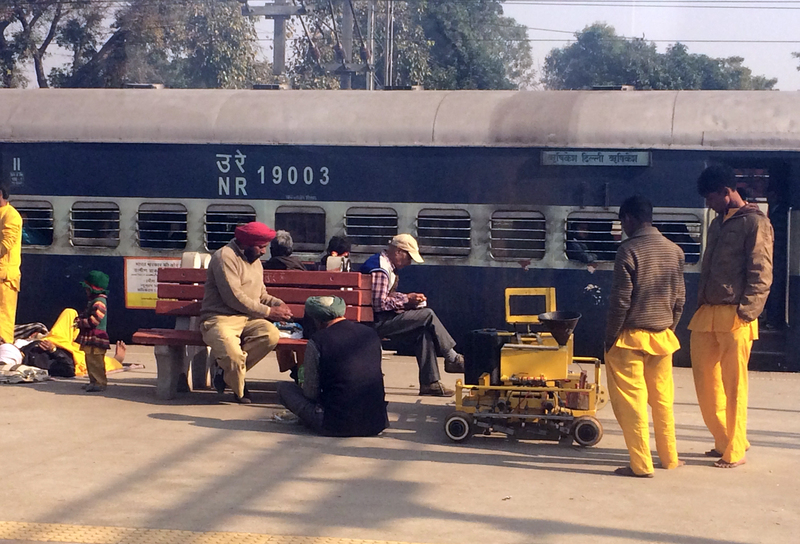 An Indian train experience could make or break a world traveler. Keeping your calm is like trying to have a picnic in the middle of the NYSE trading floor if it was in the middle of the plains during a tornado with 2,000 people speaking Klingon. And there are monkeys. As we exit the bus a swarm of red coated men with black turban type cloths on their heads descended upon us. Some started saying “Bag?” or actually trying to grab our suitcases. We were told to stick together, to watch each other and make sure we knew where are bags were at all times. I was oddly calm. I recognized these guys as more of a nuisance than a threat while others in our group were beginning to panic. They were business men, opportunists, not thieves. Although some may argue that last statement. Swamiji gathered us together and explained our seat numbers, car number and finally our track number. Still standing outside the station this all made little sense to us. But as soon as she mentioned the track number the porters began chanting 1 kilometer, 1 kilometer. I glanced at the mountain of steps we would have to take, added the one kilometer to it, plus the weight of my burgeoning suitcase and tapped a porter on the arm. He hefted my treasures and unmentionables onto his head. At the same time we were given permission to use these porters if the steps didn’t look fun to us. I followed my new red coat friend. As I was walking up the steps behind him another porter grabbed my carry on – I let him. Once we were all reassembled in front of Track 16 things began to unravel. 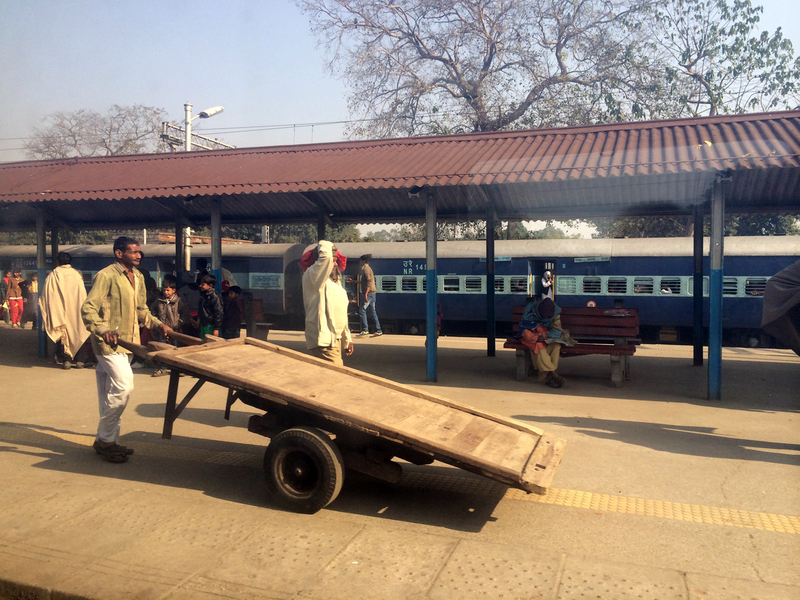 I asked my porter how much – we were told it should be around 100 rupees – he said 300. I looked a question at him and he nodded. I peeled off three hundred little bills. I found my carry on and handed that porter 100, he said no 200. I paid it. All in all I spent about $8 and I would do it again and again. They schlepped my stuff up three stories worth of stairs, down a long corridor, down two stories of stairs, further down the platform until they reached my track. And they did this ON. THEIR. HEADS. Meanwhile others have kindly paid, some have argued and one or two are just incensed at the nerve of these guys to grab their personal stuff and haul it up the steps without permission, let alone negotiating a price first. We choose the most interesting things to fight against. For me, later, it will be paying to use a dirty toilet, but let’s not get ahead of ourselves. Like naughty cows we have been corralled once again and forbidden to move. Once we’re given permission our first steps are tentative. We have found our track and our train, now we must find our cars. In America the train cars would likely be labeled on the outside in big letters and numbers. We’re constantly reminded we are not in America. The car numbers are just inside the door into the car – mostly. So we walk close to the train dragging our belongings behind us peeking in each door. Finally we have located the two cars we will occupy. 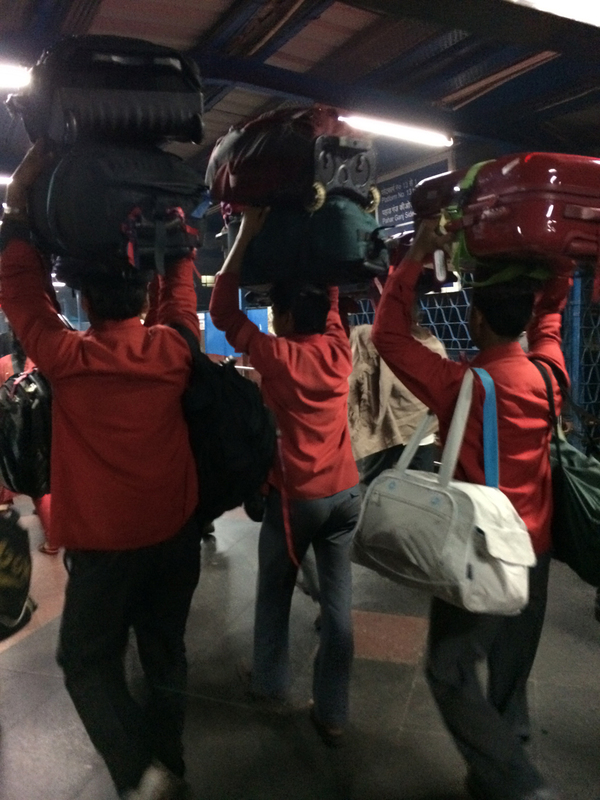 Our bags are hefted onto the train then hefted onto overhead racks. We are seated airplane style for this trip. I have scored a window seat, which would be great, but the window is dirty on the outside and does not open. I take in the passing towns and snap a few yellowed photos anyway. Saves me from having to use an Instagram filter. We are served about six times in four hours. Tea, breakfast, tea, snack, tea. During the ride we wander from car to car. At one point I join one of our group between cars to stand at the open door. The air is fresh and cool and the scenery green and lush. We’re moving away from the city. Back in my seat I retrieve my journal and pen from my bag along with my ipod and set up to write. I love to listen to classical music when I write, somehow makes me feel smarter. My pen is gliding across the pages with recent memories both endearing and funny when our train begins to slow. We will stop several times to pick up and drop off passengers. As I look out my aging window all I need to know about Indian culture is before me. The men dirty from lack of shelter pushing antiquated wooden carts piled high with mysterious bales wrapped in white; well dressed business men on their cell phones; young girls dressed in western style clothing asserting their individuality; whole families camped out on blankets with dogs sleeping nearby; chai and fruit cart vendors; a man selling papadums out of what looks like a trashcan. We must have been stopped for twenty minutes. During that time I take in the disparities and likenesses of mother India, her wealth and extreme poverty, the beauty and humanity, the lingering caste system. I am privy to her people’s thoughts on litter, fruit, commerce, dogs and monkeys. The strength of family, the joy in the children. Children are the same everywhere. I imagine conversations and destinations, the thoughts people have about each other, their own lives, us the foreign tourists. I am mesmerized. Set to classical music I have created a dialogueless movie to which I am the only viewer and it’s the most powerful movie I think I’ve ever seen. On the move again, I watch the imaginary lives I’ve become intimately acquainted with slip from view.